Refresh the senses and be reborn through the best body care treatments. Explore a wide selection of treatments ranging from your head to toe, completed with fresh ingredients that will create the ultimate pleasure. Do not miss our renowned Japonica Signature Balinese spa treatments provided by our most reliable therapists that is guaranteed to go beyond a sensual journey. 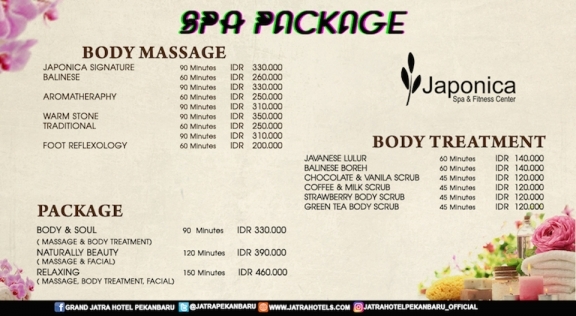 Uncovering prestigious traditional and exotic spa treatments only at Japonica Pekanbaru. Remember, relax, rejuvenate and refresh in this luxurious yet uniquely affordable body care.